How To Repair and Fix Wet Water Damaged Mobile Phone – Learn how to fix and save a wet mobile phone with water, rain or any other liquid like tea or coffee. Many times our mobile phone gets wet or drops in water and gets damaged. It can get wet with water, rain water, tea, coffee or any other liquid. After getting wet in water or any other liquid, most mobile phone gets dead and stops working. 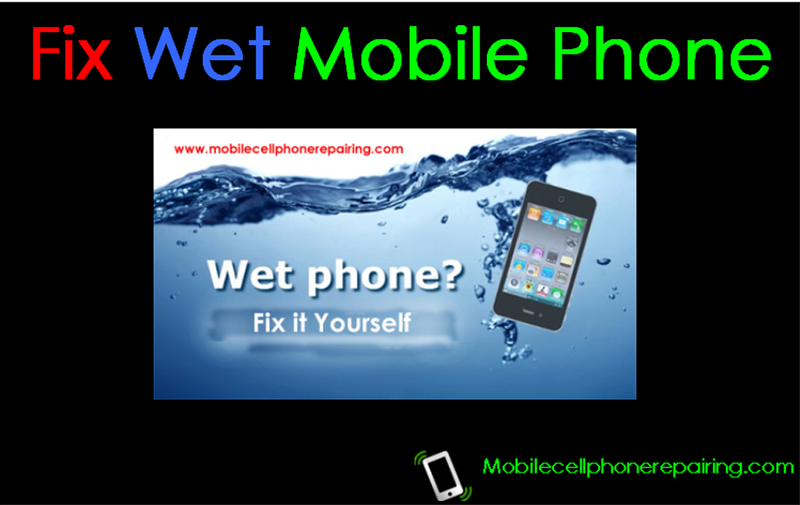 This is a reason to worry if you don’t know how to repair and fix wet water damaged mobile cell phone. But repairing and fixing a wet mobile phone is very easy. Anyone can DIY do it without having to take the mobile phone to a service center. Here I explain step-by-step process on how to repair and fix wet water damaged mobile phone. The same steps apply for all brands of mobile phone including – Samsung, China Mobile Phones, Motorola, HTC, Sony, Alcatel, LG, Panasonic, Huawei, ZTE, Spice, Lava, Sony Ericsson, Micromax, iPhone etc. Switch OFF the mobile phone and Remove the back cover and the battery. Using a precision screwdriver, disassemble the mobile phone. This is very easy. Just remove all the screws and keeps them in a safe place. Make sure to remember the order in which you disassemble the mobile phone. This will be useful when you assemble it back. If there is water in the display then you will also have to disassemble and remove the display. Using a hot air blower , carefully dry out the PCB of the Mobile Phone and all other wet parts. You can also keep the disassembled mobile phone in sunlight and let it dry naturally. Using an ESD-Safe brush and IPA solution or spirit, clean the circuit carefully. This prevents corrosion on the PCB. Now assemble back the mobile phone carefully. Now the mobile phone must work. If it doesn’t works, charge the battery and try again. If it still doesn’t works then you may have to take the handset to a service center. Is the display OK and just the Touchscreen is not working? Maybe the touchscreen was not set properly or the touchscreen that you replaced is faulty too. Pls my nokia 1280 fell inside water, died and refuse to on….. I hv disassemble it, heat the pbc, check d power ic still in good mode. Please what else can i do.? Change the battery and check. Also check the ON/OFF Switch.